The Satir Interaction Model describes what happens inside us as we communicate — the process we go through as we take in information, interpret it, and decide how to respond . In the model above, there are four fundamental steps to going from stimulus to reply: intake, meaning, significance, then response . The Satir Interaction Model can be used to dissect communication problems. It can help us to identify what went wrong in an interaction and provides an approach to resolve the issue immediately . Many communication problems occur when a response is received that is beyond the bounds of what was expected. Because the steps in the model between intake and response are hidden, the end result of the process that assigns meaning and significance can be quite surprising to the recipient, which can be a catalyst for conflict. "How dare this person insult Christmas and deny the Christ...!" "If only you'd bother to learn to pronounce 'Chanukah'..."
"Have you ever even heard of Candlemas...?!" 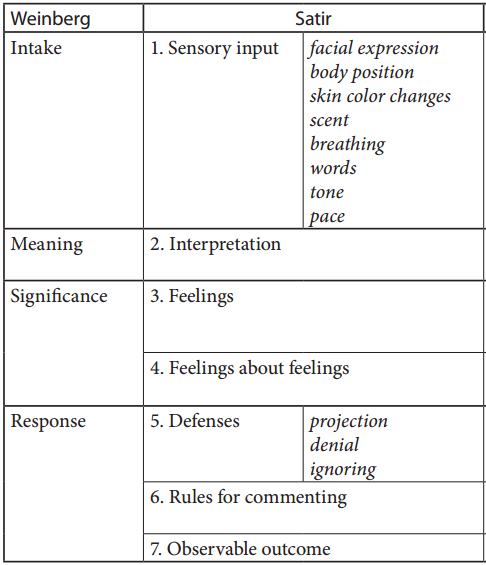 Finally, Judy Bamberger offers a very useful companion resource for adopting the Satir Interaction Model in practice . She provides ideas about what could go wrong at each step in the model and offers practical suggestions for how to recover from errors, problems, or misunderstandings. Using this illustration he specifically differentiates between a reaction a response. A reaction happens when a person skips the meaning and significance stages, and simply jumps straight from intake to response. When both people in an interaction become reactive instead of responsive a fight is the likely result . Understanding that these missing steps may be the cause of a misunderstanding could help resolve the situation. 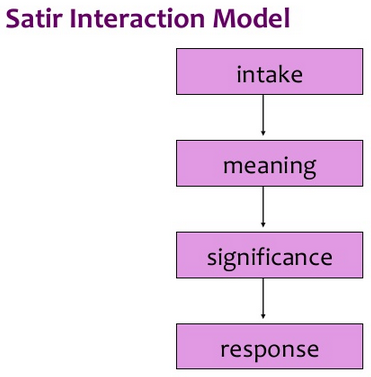 The Satir Interaction Model may also be useful in structuring conversations to address unacceptable behaviour. Esther Derby suggests that these conversations should begin by getting agreement that the behaviour happened, followed by discussion about the impact of the behaviour, then conclude by allowing the recipient of the message to realise that their behaviour is counter-productive . Interesting correlation; asking something similar to “What did you see or hear that led you to that conclusion?” is what started me developing the ideas that would turn into my Trial by Reason workshops that I ran through WeTest Workshops over the last year (which I'm not sure you attended, but you might remember something about them) [The interesting correlation being that I am an NT].